Artūras Paulauskas of the Labour Party (Darbo Partija) was elected as the Chairman of the Committee on the National Security and Defense. Michal Mackevič from the Electoral Action of Poles in Lithuania (EAPL) was chosen the Deputy Chairman of the aforementioned committee. 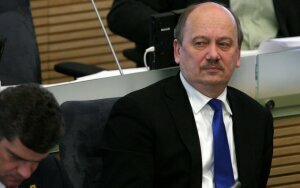 Six members of the committee voted for Paulauskas, whereas three of them decided to abstain from voting. Not all questions posed by the committee members that concerned the issue of national security in the coalition programme were answered by Paulauskas. The politician underlined the fact that he acted rather as a legal advisor during the programme development. Michal Mackevič, EAPL’s representative and the president of the Association of Poles in Lithuania, was selected the Deputy Chairman of the Committee. In an answer to a question Mackevič confessed that he possesses the Polish Charter (‘Karta Polaka’). However, he stressed that this document does not impose on him any obligations towards the foreign country. Apart from Paulauskas and Mackevič, the committee members include: Rasa Juknevičienė (a conservative); Juozas Olekas (a social democrat); Algis Kašėta (a liberal); Arvydas Anušauskas (a conservative); Remigijus Ačas of the Order and Justice (“Tvarka ir teisingumas”); Valdas Vasiliauskas of the Way of Courage („Drąsos kelias“); and Eduardas Šablinskas and Darius Petrošius (both socio democrats).